Ben Lerner, Colin MacCabe and Adam Bartos combine their talents to create a beautiful tribute to a filmmaker and artist. 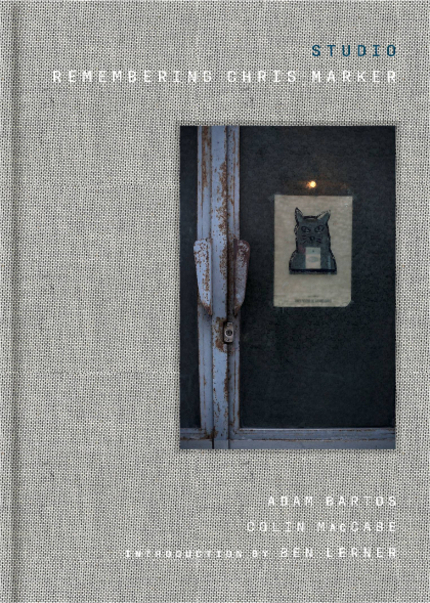 Studio: Remembering Chris Marker is a new hardcover release from OR Books that marries an introduction by Ben Lerner and an essay from Colin MacCabe with photos from Adam Bartos to create a beautiful tribute to the late filmmaker-artist Chris Marker (1912-2012). Colin MacCabe's interactions with Marker began in an atypical way in 2002. An acquaintance gave MacCabe a VHS copy of The Magic Face. As Marker was obsessed with the film, the tape served as MacCabe's proverbial ticket to a meeting with Marker at his Parisian apartment. Over the course of many years and many subsequent visits, the MacCabe-Marker friendship became increasingly strong as MacCabe assisted Marker in his numerous cinematic and artistic projects. Thus, Studio's central essay is more personal than analytical, which is extremely refreshing. In 2007, photographer Adam Bartos visited Marker's apartment in Rue Courat. Bartos did not take photos of Marker, who was famously reclusive. Instead, Bartos captured beautiful photos of Marker's densely cluttered studio, which was jam-packed with books, video tapes, editing equipment, computers and movie memorabilia. These photos are peppered throughout Studio and the most striking images are reserved for full-color fold-out plates towards the end of the book. Bartos' photos serve as a rare glimpse into Marker's life and mind. The equipment depicted is now outdated. Much of the media is in dead formats. Yet these are the tools that Marker used to create numerous vital works in his later years. These are the objects that inspired him. Although Studio provides significant details about Marker's biography, it doesn't contain an extensive discussion of Marker's filmography. One can find numerous other books and essays about the films themselves. Studio serves a different purpose. It is a unique and loving remembrance of Marker's life created by people who deeply cared about him and his work.